Today, I will take you in the “beautiful” Polish: Krakow. Often compared to Prague, Krakow is more discrete and you will only need one day and a half to see most of the city. First, you may prefer the quiet Kazimierz (Jewish neighborhood) to stay in than the old center. The city is not so big and you will be in the center in 10 minutes top. To visit Krakow, nothing complicated. You can start with the Wawel (old castle and cathedral), then wander in the old city and finally in Kazimierz. In the old city, you may admire the market square (Rynek Glowny) and the Notre Dame St. Mary’s church (don’t pay the entrance, just go inside as a prayer and do not act too much like a “tourist” and everything will be fine). As you will find out, Krakow is full of churches; it is still the city of Pope Jean Paul II. They all have an outside charm yet they are very (too much?) gilded and sparkling inside (which can be really intense for your poor eyes). So, if you are not on a pilgrimage and do not have a week in Krakow you may want to see only two or three churches. Oh by the way, a little advice for the men, only the men (because you’re worth it): take of your beanies, hat or whatever you may have on your head, it is forbidden and people will say it to you all the time (nicely or not). Concerning the synagogues in Kazimierz; the outside is really charming while the interior is really simple and peaceful with some nice Hebraic inscription on the walls. Kazimierz breathes peacefully during the day, however, during the night the neighborhood changes completely and you can discover the heaven of beer, vodka and polish cuisine. We needed to talk about it at one point. If 25% of the polish population is obese, it is not because of vegetables or water. Indeed, the city is impressive with all the different kind of beverages and food that you can try. 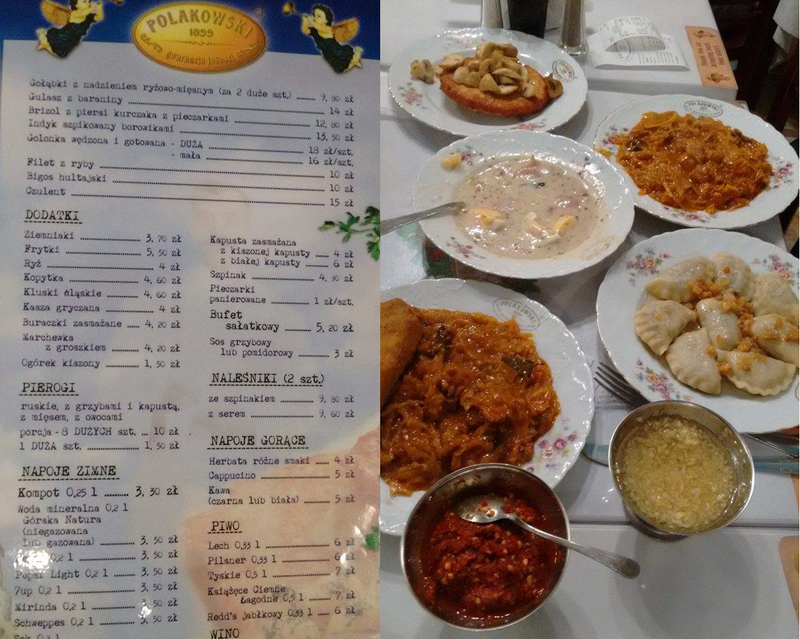 You can try the Pierogi (kind of traditional dumplings), the Bigos (the “hunter’s stew” with meat and cabbage), all the Kotlet (similar to roasted chicken, beef…) etc. You will never be disappointed. You understood it already; this food is rich, rich, super rich and pretty caloric. Indeed, the polish cuisine is a lot fatter than the Mediterranean one. The lack of vegetable is very important and even if the national specialty is the Bigos, the fact that there is almost the same amount of meat and delicatessen as cabbage does not make it a dietary food. For the rest, it is mainly starchy food, roasted meat and a lot, like A LOT of oil and butter. So, just be aware that you will not go to Krakow to do a diet. Good point though, you will not need to empty your wallet. Just go in one of the multiple Mleczny (“milk bar”) in the town, which are cooking all of these meals. Maybe a little warning; a Mleczny is more similar to a popular kitchen than a restaurant and nobody will talk to you in English there. So just try it, try to order without knowing much, try to appreciate the local food in the local place and it will be perfect I can assure you. Finally, for the people who crave for history you can spend an entire day visiting (actually more wandering) Auschwitz and Birkenau, the sadly famous Nazi camps which are near Krakow (less than 2 hours by train). You will for sure learn a lot even if you need to be aware that the tension there is quite intense. If you want to do something softer, you should visit the old salt mines (20 min by train). You will need to walk a lot there (more than 800 steps) but this is the most visited place in the region and it is very impressive. In short, if you like good food (and still, you are not on a diet!) and have a free week-end to visit one city in Europe, Krakow can be your paradise.